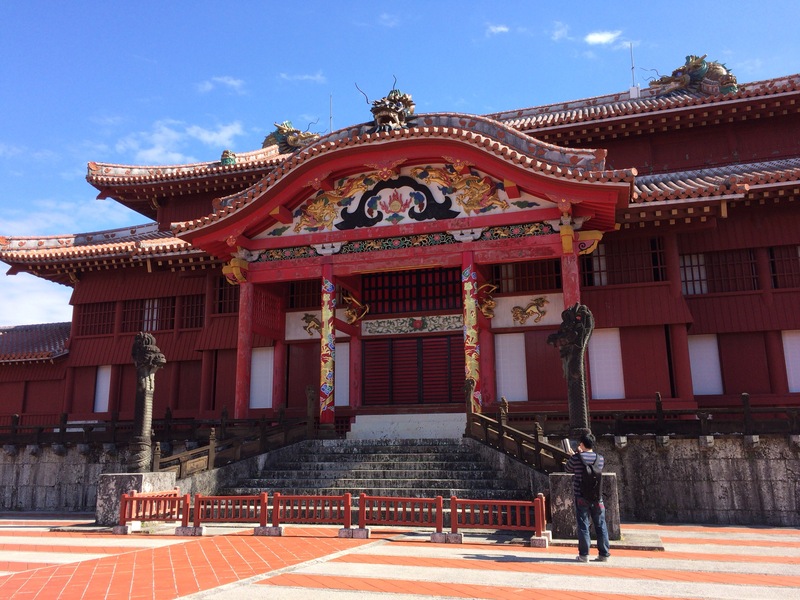 After purchasing a ticket at the ticket office (Koufukumon Gate), I passed through Houshinmon Gate, whose name means “respecting gods.” Houshinmon Gate has three entrances, and the central entrance was reserved only for the king or nobles. Houshinmon Gate led me to a square in front of Shurijo Castle Seiden (the main palace of Shurijo Castle) called Una. First, I entered Nanden/Bandokoro located on the right side of the square, and then headed to Shoin/Sasunoma. Nanden serves as a resource center and it is not allowed to take photos in it. In Sasunoma, which served as the prince’s waiting room in the past, there is a rest place where you can enjoy the traditional Ryukyu sweets and sanpin-cha (jasmine tea) for 310 yen. You can relax in the good traditional atmosphere, so I recommend you take a rest here if you get tired after walking around Shurijo Castle Park. They serve four types of the traditional Ryukyu sweets (Hanabouru, Kunpen, Chiirunkou, and Chinsukou). I am not familiar with these names except Chinsukou, but the taste of all sweets was very nice, and they went great with a hot sanpin-cha. You can get free refills on sanpin-cha. Shoin/Sasunoma has a nice garden view. The garden is designated as a place of national scenic beauty. Shoin/Sasunoma connects to Shurijo Castle Seiden (the main palace of Shurijo Castle), which served as the residence of the King of Ryukyu for approximately 500 years. It was burned down during the Okinawa War of 1945, and was restored in 1992 based on Shurijo Castle in the 18th century in the commemoration of the 20th anniversary of Okinawa’s reversion to Japan. There is a throne called Usasuka on which the king sat when he held royal family events in the second floor of Shurijo Castle Seiden called Ufugui. After passing through Shurijo Castle Seiden, there is Hokuden, the final destination of the paid area. Various materials and models are exhibited in Hokuden, and there is also a store selling souvenirs, etc. It took me around 2 hours to look around Shurijo Castle (from Shureimon Gate to Hokuden). Shurijo Castle Park is quite big, so it may be better to spend the whole day walking around the park and the Castle. As this was my first visit to Shurijo Castle Park, I couldn’t visit some places, so next time I will take time looking around the whole park. Before leaving Shurijo Castle Park, I bought a mango soft-serve ice cream at Blue Seal Ice Cream, an ice cream chain from Okinawa, located in the space in front of Suimuikan (Shurijo Castle Park Rest Center). I had never imagined that an ice cream eaten outside at the end of January was so nice. “Sankakuten (Triangular Point)” in Irabu Island Is A Popular Viewing Spot Overlooking the Cobalt Blue Ocean!